Over the last six months the practice has taken on a total of 17 new employees across a number of roles, including architects, visualisers and architectural technicians, in its Warwick, Birmingham and London offices. 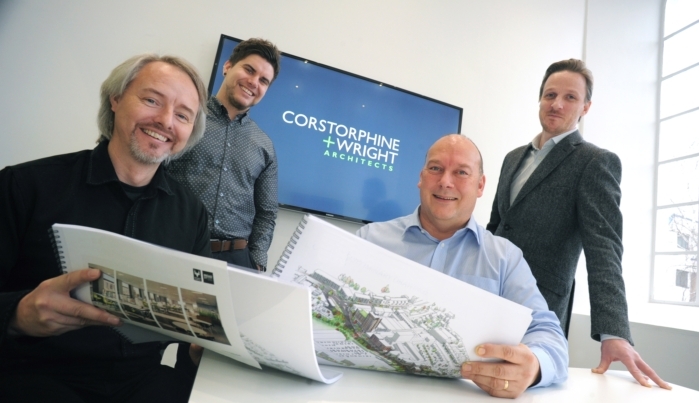 The recent hires include Ian Wilson, Spencer John and John Medley, who have been appointed as Associate Directors and will be working from Corstorphine + Wright’s head office in Warwick. Internally, Matt Hibbitt and Mario Iandoli have also been promoted to Associate Director. Prior to joining Corstorphine + Wright, Ian Wilson has delivered RIBA award-winning designs for Howl Associates and high profile developments for 3D Reid Architects, utilising almost 20 years’ of experience to deliver a range of projects across the UK, including a number education facilities, from nurseries to schools. With 15 years’ professional experience, Spencer joins Corstorphine + Wright from Associated Architects. With a specialism in the higher education sector, Spencer has delivered designs for the Royal Holloway University of London, University College Birmingham and University of Loughborough with values in excess of £59 million. Formerly a Director at Level Seven Architects and with over 35 years’ experience in architecture and property development, John Medley joins Corstorphine + Wright from Tesco PLC where he was a Development Planning Manager within their property services department. His previous experience includes the award-winning Fort Shopping Park in Birmingham, the 260,000 sq ft Monks Cross Shopping Park in York, and the 600,000 sq ft Market Central Da Vinci in Rome. These latest hires follow the appointment of Rav Kumar as a Director and head of the company’s new Birmingham studio, based in the Jewellery Quarter.